You can catch flies with honey, but you can catch even more with the stench of carrion. I went to see Trudy the corpse flower blooming at the UC Botanical Garden in Berkeley. Corpse flowers (Amorphophallus titanum) earn that lovely goth name by exuding the stench of rotting meat to attract flies to act as pollinators, and they’re not shy about it. The smell is potent, Trudy filed the UC glass house with the smell of roadkill goat, and it’s effective, too; there were ten or twenty flies buzzing around it while I was there, and apparently there’s a bigger swarm in the morning when the smell is strongest. And it’s all a con job on the flies; they lay their eggs thinking there will be food for their offspring, but the children hatch and starve without a genuine carcass to feed on. The flower is six feet tall and impressive even without the stench. Corpse flowers are from Malaysia and they take seven or more years to bloom, waiting until the plant’s corm weighs thirty pounds or more. 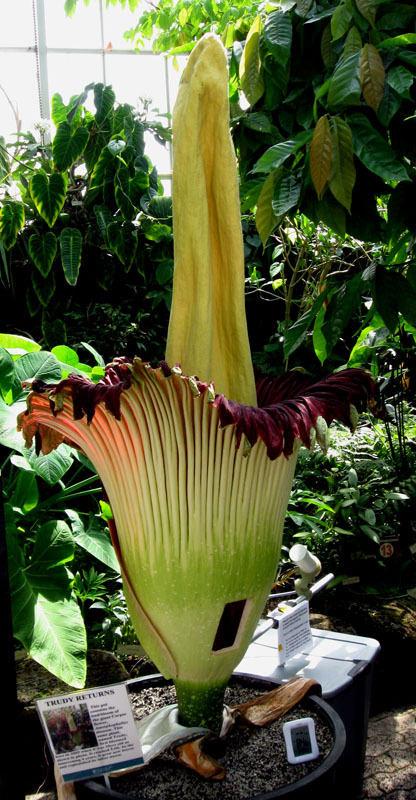 The bloom, which is actually a collection of little flowers, has a claim as the biggest inflorescence in the world, and the spadix (the big spike sticking up in the middle) generates heat, up to twenty degrees warmer than the ambient temperature. Someone at the garden has a sensor set up to test if the plant gives off a biomagnetic field the way humans and animals do. This particular corpse flower, Trudy, first bloomed in 2005 at age twelve, and then waited four years to bloom again, making this her second time blooming, though the garden has others which bloomed while Trudy was resting. The bloom will only last a couple of days before it gets pollinated and collapses. The garden’s website has tons of photos and regular updates. For years, we’ve been getting emails every time one of them blooms, but this was the first time I went by to check it out, and, I gotta say, it was pretty cool. There are seedlings for sale if you want to pay thirty dollars for an indoor plant that requires constant watering and feeding and smells like carrion when it blooms. Photos of nice-smelling flowers are below. After the corpse flower I made a beeline for any fragrant flowers I could find. It was nice to stick my nose in a mock orange. I’m now appreciative of plants that don’t try to imitate carrion with their fragrance. 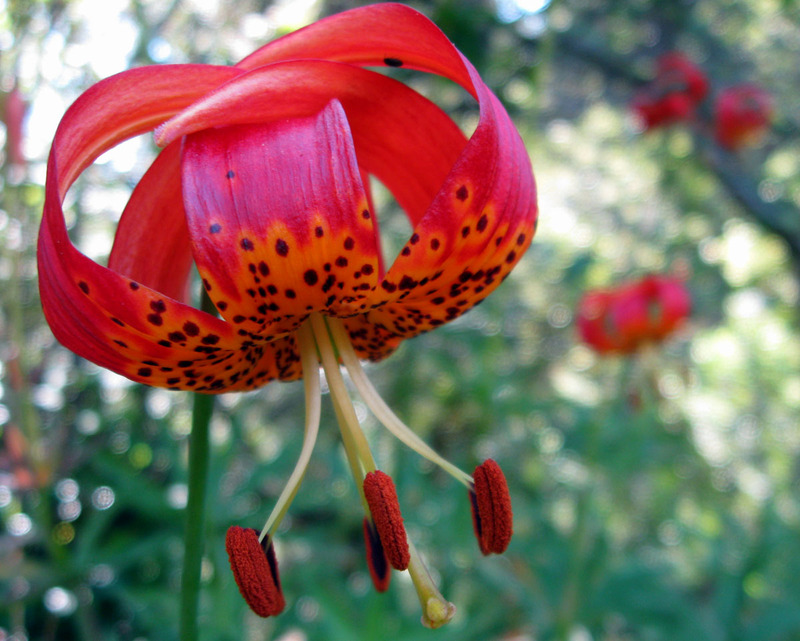 The Pitkin Marsh Lily, relative of the Leopard Lily and Corralitos Hybrid Lily, has a weak fragrance, but it sure is pretty. The spicebush flowers were getting old, but that suited their old wine barrel smell. 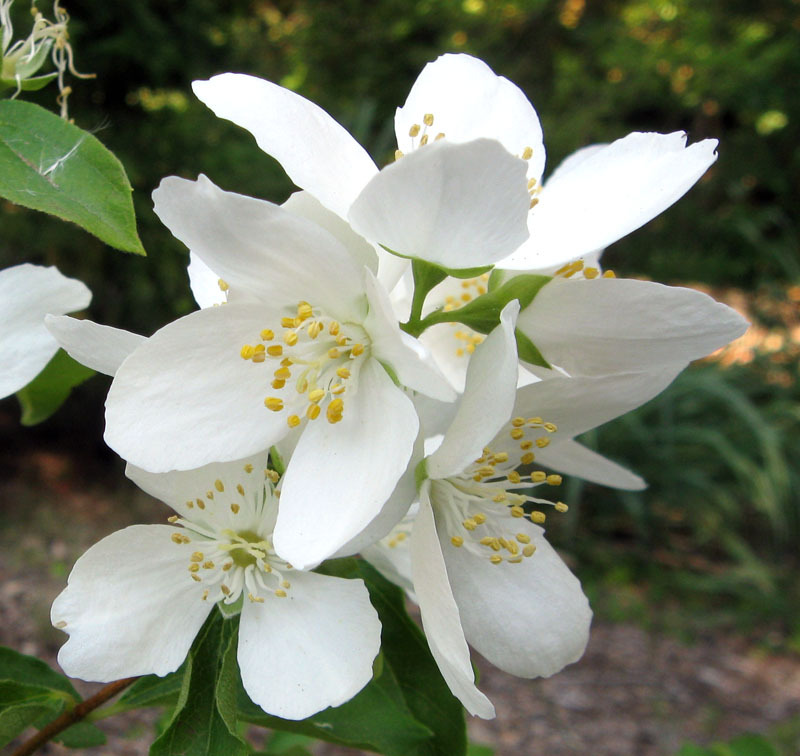 And I became appreciative of how many fragrant plants are blooming in our yard right now. 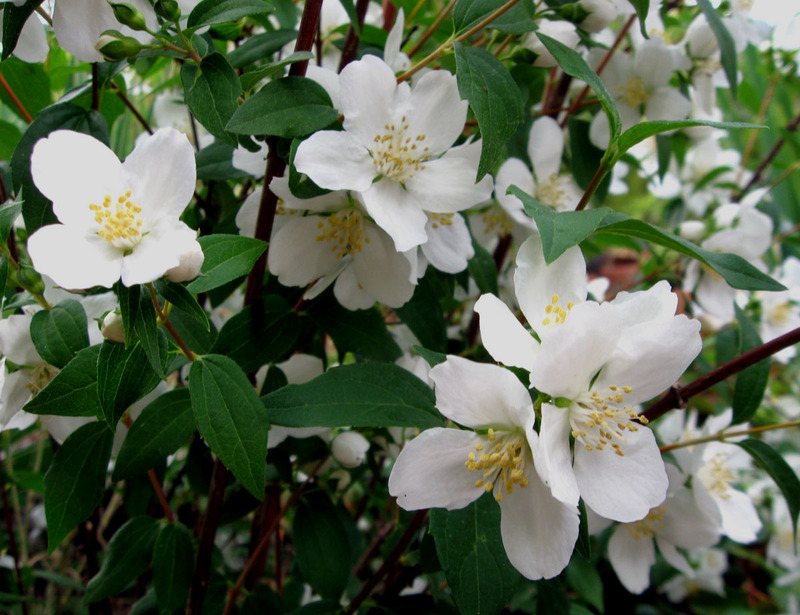 The mock orange is the champion. We don’t remember for sure which type it is, maybe P. microphyllus or a P. microphyllus hybrid. 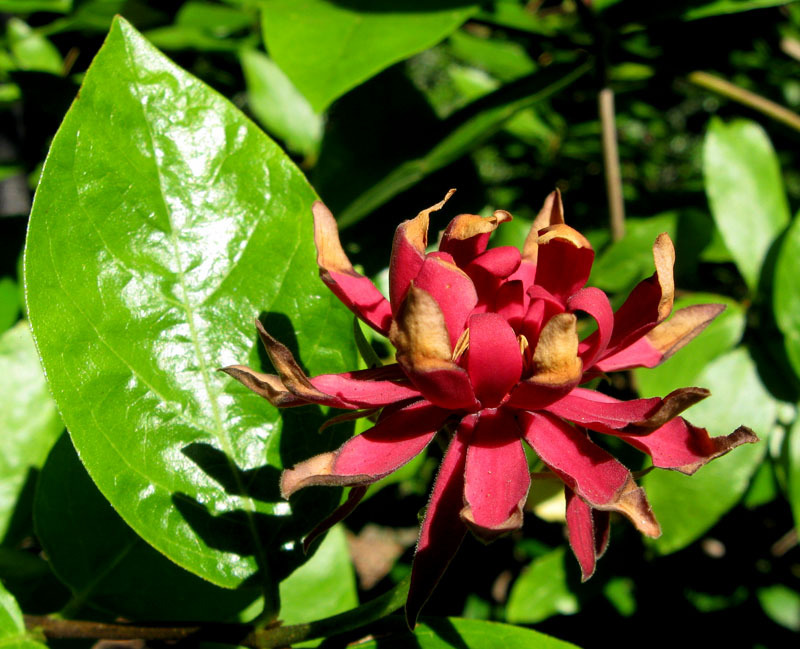 Smaller mature size, smaller leaves, and better fragrance than P. lewisii, the native one. 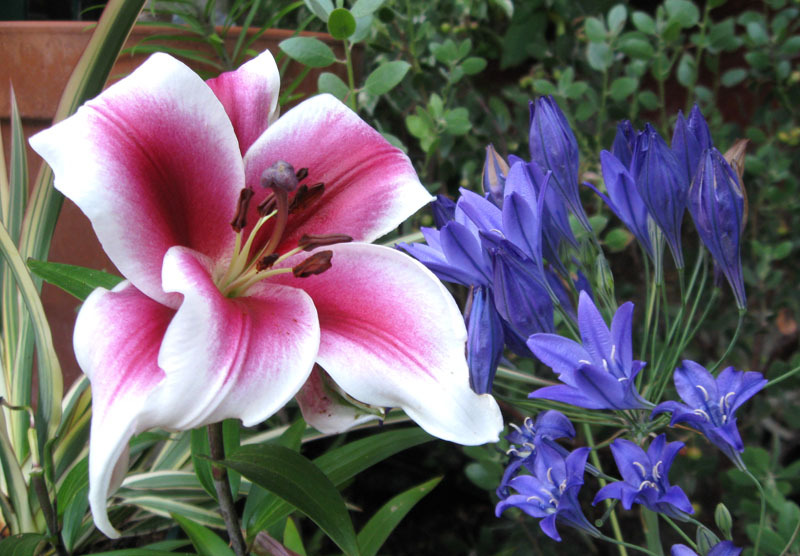 A fragrant hybrid lily beside some brodiaeas in the stacks of pots alongside our porch steps. 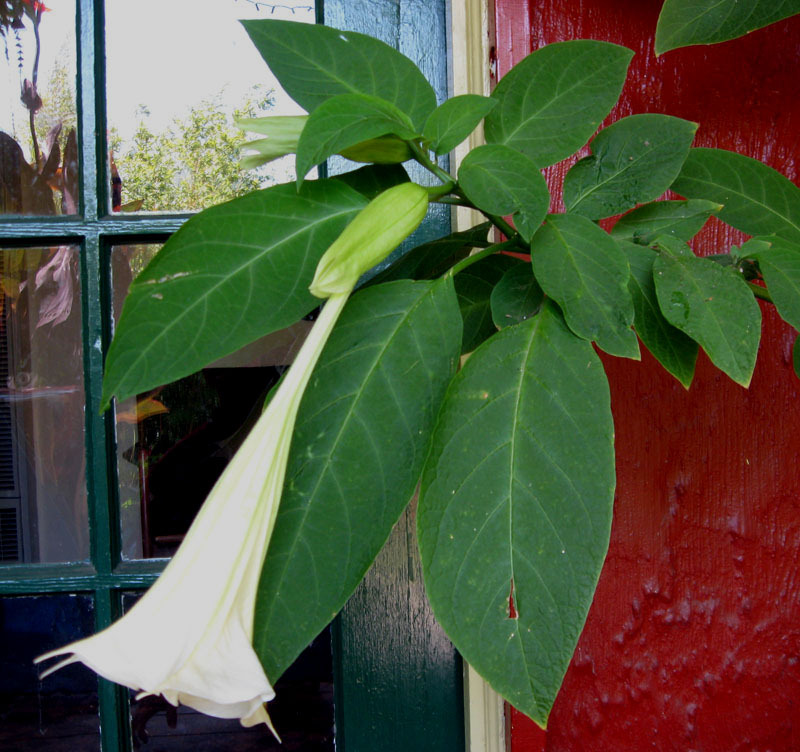 Our brugmansia is now growing in front of the door knob. 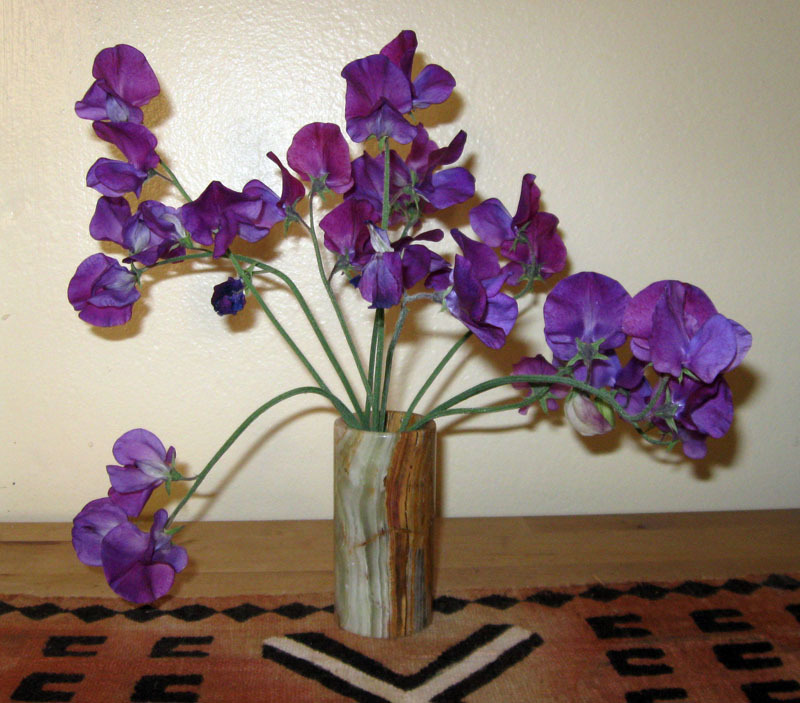 And a fist full of sweet peas stuck in a vase to bring some non-carrion fragrance inside. 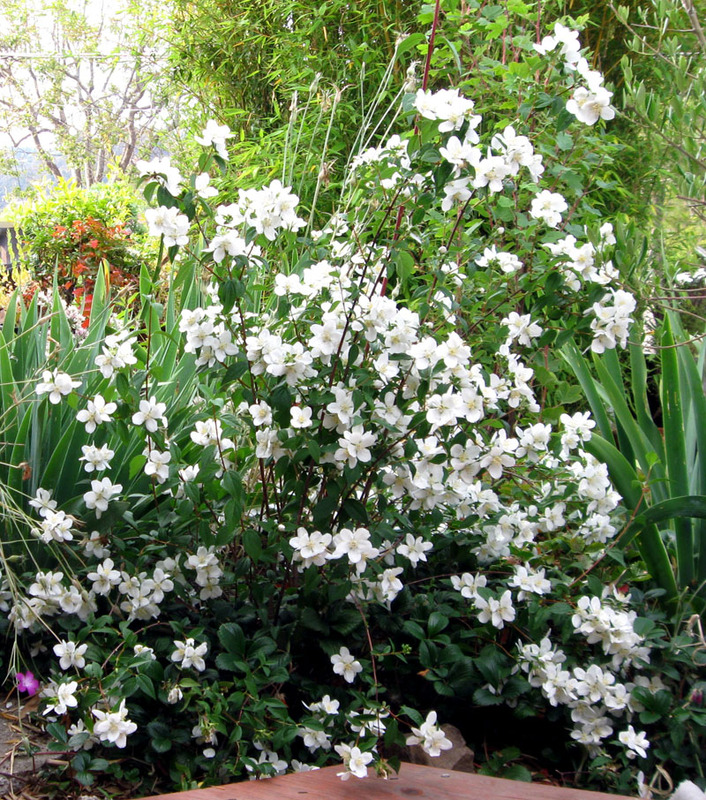 We had white ones, which were more fragrant, earlier in the year, but they’re done. These purple ones grew ten feet tall, so we need to stand on a chair to cut them. A much better cut flower than Trudy. This entry was posted on Tuesday, June 23rd, 2009 at 10:15 pm and is filed under plants, public gardens, UC Berkeley. You can follow any responses to this entry through the RSS 2.0 feed. You can leave a response, or trackback from your own site. Trudy and her sisters got my vote in the RHS poll of ugliest plant–fascinating though! agreed. trudy is disgusting but fascinating. the other blooms in your garden look great. That’s really something! And to think I was so close, and went to Tilden instead…Then again, to leave a visitor with fond memories, Tilden might have been a better choice. Reading your post, Town Mouse, I don’t think the corpse flower was open yet on the day you were up in the area. It only stays open and stinking for a few days before it collapses. The UC garden is really nice, if you’ve never been. They charge $7 for admission, but they have a big native section and a some other really nice collections. Maybe next time a corpse flower blooms. Tilden’s looking really good right now, though. Can’t fault you on your choice. I had to post photos of flowers that smell nice and look nice to counterbalance Trudy. I didn’t really find her ugly, though. Too fascinating and weird to consciously think about ugly/pretty, I guess. Oh the annual corpse flower bloom! I love the botanical gardens at UC, thanks for the nudge to get back up there. lovely to see in someone else’s garden. I think the seedlings might get cheaper over time. From what I’ve heard, they’re not difficult to propagate and so they are getting more and more common every year, especially since they are good at drawing crowds to the bot gardens. The UC now has a whole collection of them, and there was a smaller one about to bloom right after Trudy. The plant looks nice enough while it’s not in bloom, but they’re big. It never really ocurred to me to have one because of the daily care it would require and my lack of a place to keep one, but I would have respect for anyone who did have one. I hadn’t noticed that it looks phallic, but you’re totally right. I guess the carrion stench had me thinking on a different wavelength, the effect of Trudy’s anti-cologne, anti-perfume. I love that this plant is called Trudy. How do they name them I wonder? I mean, you’d hardly name that thing after your firstborn would you? A favourite aunt perhaps? But I envy you seeing this thing, I really do. I’m sure there is at least one Corpse flower at Kew Gardens, I should find out and make sure I’m on their mailing list for when it blooms. I read somewhere that there’s a tradition of giving the plants a name that starts with “T.” I can’t remember why.